The ever-changing faces of mahina (the moon) not only appeared as a celestial almanac, it served as a spiritual guide for the ancient Hawaiian kahuna’s mystical practices. 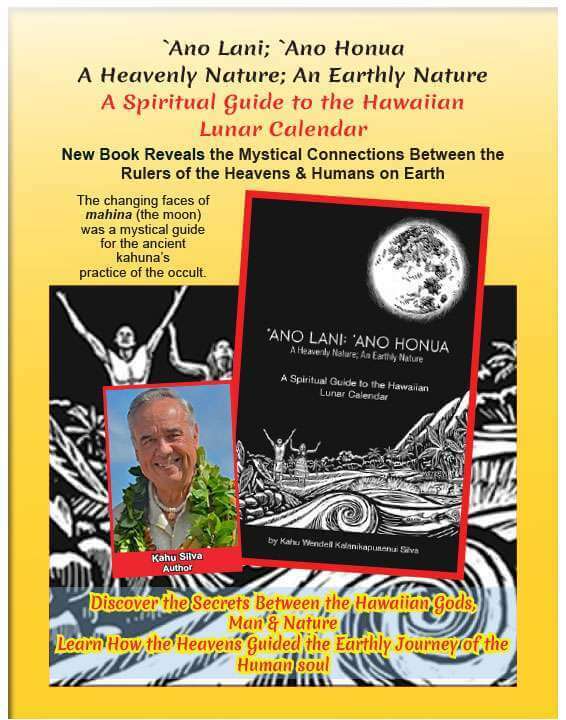 The new book `Ano Lani; `Ano Honua – A Heavenly Nature; An Earthly Nature, reveals the sacred connections between the supernatural rulers of the heavens and humans on earth. Discover the secrets shared between the Hawaiian gods, nature and man. 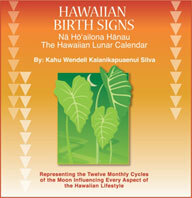 Learn how the heavens and the kahuna spiritually guided the earthly journey of the human soul. Learn how you can guide your own journey with this knowledge. Coming soon to island bookstores, Amazon and directly from the publisher, Hawaii Cultural Services. 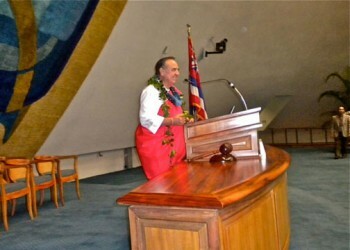 (January 30, 2014) Kahu Wendell Silva was invited by Senator Suzanne Chun Oakland to share some inspirational mana’o (thoughts) at the convening of the Hawai’i State Senate session. 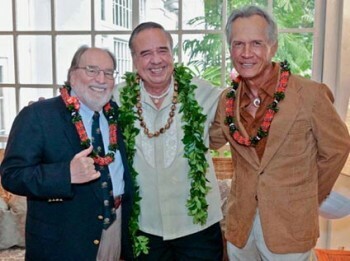 Kahu graciously concluded his opening remarks with the offering of his best wishes, spiritual blessings and the customary exchanging of aloha. “We really appreciated him coming and sharing his wisdom with us,” were among many compliments received from Senator Chun-Oakland’s office and individual senators. Entertaining and culturally authentic! Learn about Hawaiian mysticism and the secrets of the ancient kahuna kilo hōkū stargazer, seer) interpreter of the cosmic signs, who used the laws of heaven and earth, an individual’s birth date and other sacred divination tools to forecast a person’s life path. For the first time, the astral mysteries are revealed for all 12 months of the ancient Hawaiian lunar calendar and offers a practical and inspirational guide for living today. Dramatic narrative enhances the monthly musical highlights – mele (songs) and traditional oli (chants) performed in the kahiko (ancient) style. Powerful calls of the conch shells herald each month and 5 traditional Hawaiian percussion instruments and 2 wind instruments are nature’s many voices: pahu (drum), kala`au (dancing sticks), `ili`ili (stone castanets), `uli`uli (rattling feather gourd), ipu heke (double gourd), `ohe hano ihu (bamboo nose flute) and pū, (conch shell). Their instrumentation masterfully conveys the changing seasons, their natural manifestations – rain, storm, gusty wind – sacred representations of the powerful Hawaiian gods. The listener embarks on a journey of self-discovery along with the ancient Hawaiian seafarers as they paddle in time to the steady tempo of the pahu in the canoe prayer chant, Ia Wa`a Nui. 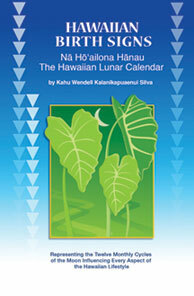 The author cleverly uses the double-hulled canoe to symbolize the dual nature of people born in Kau-lua (February). Auhea la `oe e na Kona, a new composition for Nana (March) is accompanied by the kala`au and beckons kama`āina and malihini to behold the serene beauty of Kona, “wreathed in a garland of sea clouds like hinano blossoms.” Springtime blooms in Welo (April) with the sweet melody of the rare `ohe hano ihu instrument of romance and courtship in old Hawai`i. The harvesting and pounding of kalo (taro) into poi made the hard work easier as the men pounded to a rhythmic beat with the `ili`ili which replaces the tradtional stone poi pounder. The mele ends with, “a delicious treat, indeed, the best. Ah! Satisfaction guaranteed.” A very special message to the people of Hawai`i is shared in Māhoe-hope (September) and a prayer chant in Makali`i (December) Pele Honua Mea, is offered to volcano goddess Pele, in the spirit of aloha. This audiobook is a companion to the book of the same title.